Why Play For the Islanders? 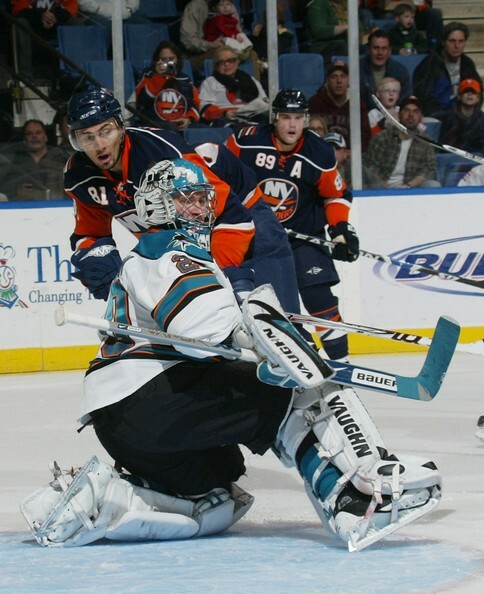 Everybody knows that the Islanders recently stole goalie Evgeni Nabokov away from the Detroit Red Wings on waivers. He would get paid over half a million dollars to play the rest of this season. Then Nabokov made what seemed like an easy decision to him at the time, to not show up to the Islanders. Why would he do this? There are many reason to go to the Islanders, and not to. Now I present to you a big decision, To Show Up or Not To Show Up? He can use the rest of this season as an "audition" to prove to other NHL teams that he is capable of still playing at the high level required to be great in the NHL. After this season, he is an unrestricted free agent and can go anywhere, unless he wants to return to the Islanders. The Islanders can appeal to the NHL to "toll" his contract. This means that he would not get paid at all for this season and his contract would not begin until next season. Essentially, this would push back his contract and keep him from becoming an unrestricted free agent. He can prove to other NHL teams that he is a team player and just show up, and try his best to help the struggling Isles. He wants to be a part of a team that can make a deep playoff run. The Islanders are most likely not going to make the playoffs this season. Nassau Coliseum is an old, dirty, and just plain bad arena and not that many players want to play there. He would have to find a place to live for the next few months, then have to do it all again once he signs with a new team next season. If he does not want to show up, more power to him. It now looks like Nabokov is going to pull a Darrelle Revis. He will try to hold out as long as possible until something happens. Also, the Islanders really need a goalie, badly. He could help the team right now. Let's hope that Nabokov and the Islanders can resolve something soon. We hope to see you in this crease soon Evgeni, just wearing a navy blue jersey. Typical New York Islanders "Fan"
Yes the Islanders are doing better recently, but I found this hilarious. Whenever anything happens for the Islanders, something always seems to go the other way. For example, the Islanders had a chance to keep all of the following people. If they kept even half of these people, they may have had Stanley Cup #5 on Long Island in the past decade. Roberto Luongo- Drafted by the Islanders in 1997. After playing one season with the team, he was traded along with Olli Jokinen to the Florida Panthers in 2000 to make room for Rick DiPietro. We all know how that worked out. Zdeno Chára and Jason Spezza- Big Zdeno Chára was drafted by the Isles in 1996. After four unproductive seasons with the Islanders, he was traded, along with the Islanders first round draft pick, to the Senators for center Alexei Yashin. The Senators used the Islanders draft pick to select Jason Spezza as the #2 overall selection in the draft. As of right now, Spezza an Chára are all-stars and Yashin is still on the Islanders payroll. The Whole 2003 NHL Draft- The Islanders had the 15th pick in the 2003 draft. They used it to select Robert Nilsson. (Again, who?) Two picks later the Devils selected Zach Parise. Other men that the Islanders had a shot at, but passed on were: Ryan Getzlaf, Mike Richards, Corey Perry, Shea Weber, and team USA hero during the last Olympic Games, Ryan Kesler. This video pretty much sums up the Islanders recent failures. And now, just after the new year, the Islanders traded away Rollie the Goalie to the Lightning for defenseman Ty Wishart. In his first game as a member of the Lightning, while wearing his New York Islanders mask, Roloson shut out the Capitals, in Washington. Good for him. Bad for us. And, to top all of this off, Rick DiPietro got injured in the Islanders first game after the new year and has been out. Now the Islanders need to rely on rookie goalies Nathan Lawson and Kevin Poulin (Who?) until DP can heal. I can't wait to see how this turns out.